General Elections in Albania, a round up one week before the vote. The Albanians are being called to ballot on 28th June to renew the 140 members of parliament. 4,000 candidates representing 45 parties (36 of which have united in four coalitions) are running in these general elections that will take place according to regional proportional representation and according to a new law that accentuates the bipolarity of the political system. - the Socialist Alliance for Integration is led by the Socialist Movement for Integration of former Prime Minister (1999-2002) Ilir Meta and rallies five parties: PSV 91 of Petro Koci, the Green Party, the Movement for Human Rights and Freedom, the Immigration and New Tolerance Party. The President of the Republic Bamir Topi sees these elections as the last to take place in the transition period started in 1991. He believes that they are a test for Albania's European future and must therefore be free, transparent and meet with Western standards. He has asked the members of the Electoral College to adhere strictly to the Constitution and for voters to take part in the vote, since turnout is a vital criteria in terms of democracy. Finally he called on all citizens who have not already been to collect their card to do so immediately. To fight electoral fraud the new electoral law stipulates that every voter who does not have a passport will be equipped with a voter's card that he/she will have to present at the polling station. 1.3 million people have already requested the card and 1.2 million have received the document according to the Home Minister. 3.1 million Albanians are registered on the electoral rolls. "These general elections are very important for democracy in Albania and for the country's integration into the European Union," stressed Robert Bosch, representative of the Organisation for Security and Cooperation in Europe (OSCE). Prime Minister Sali Berisha regularly encourages the Albanians to collect their card. "Nothing could be more important for us than to organise the best elections in Albania's history," he says. "We have to guarantee that the electoral process takes place in a free and loyal manner so that we have the means to plead our cause again," he declared, referring to his desire to see Albania integrate the EU as quickly as possible. 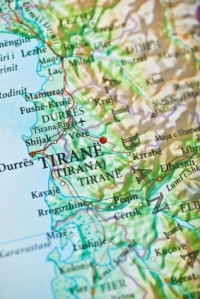 The latest incident in the campaign: Artan Zeka, a Democratic Party supporter was killed by a member of the Socialist Party, Skender Balla on 12th June in Qeurret, a village 30km south west of Tirana. This murder is the second in the campaign after that of Socialist MP Fatmir Xhindi, at the beginning of May in Roskovec (120km to the south of Tirana). Prime Minister, Sali Berisha, is campaigning on the results he has achieved as head of government. His term in office was marked by an improvement in infrastructures and a major tax reform. "In four years, with our government allies we have doubled salaries and retirement pensions. We have finalized our major road project building a motorway between Durres and Kukes (which will be inaugurated at the end of June) thereby reducing travel time between Durres and Morina – the crossing point between Albania and Kosovo - by four hours. Our reforms have pushed back crime and corruption, opened the doors to NATO and the EU for Albania and during the first days of our term in office they will enable free movement for Albanians across all of Europe," he declared adding, "my government devoted 4.2 million euros more than the previous one to the fight against corruption." He points to the increase in foreign investment in Albania maintaining that the world is experiencing an economic crisis and Albania will see GDP growth of 8% this year ie higher than that of any other European countries. Sali Berisha also tries to claim his share in the transformation of Tirana into a clean, modern town. "We have rebuilt the country and developed new infrastructures," he said, stating that after 28th June his government would address the problem of illegal constructions and corruption that are still rife in Tirana. "We shall solve traffic problems in the capital and we are determined to encourage business development. We have projects to build industrial parks around the capital," he said. Finally on 8th May next the Prime Minister promised that the next government would only have 11 or 12 ministers. "We are a small country and the government has to match our size. The Socialist government had 18 ministers, we already reduced this to 14," he stressed. Sali Berisha is promising the creation of new state jobs, another increase in salaries and retirement pensions and major investments in education, healthcare and infrastructures. He wants to increase the amount of money dedicated to agriculture six fold. "It is the first time that a government has doubled salaries during its four year term in office. No other government before this has multiplied the State budget and citizens' income two fold and reduced taxes by 1.3 million leks (9,940 €), ie twice that collected by the previous government in 8 years," says Jozefina Topalli, Vice President of the Democratic Party (PDSH), President of the Parliament, and candidate running in the region of Shkodra. Fatir Mediu, chair of the Republican Party (PRS), the PDSH's partner within the government coalition launched its campaign saying that a second mandate with this political majority would enable Albania to achieve its dream and become a member of the EU. "We promised in 2005 that with Sali Berisha we would change Albania. Tomorrow we shall work very hard to join the EU. We are experiencing a special moment: Albania now belongs to the civilised countries," he indicated. The Socialist Party (PSSH), the main opposition party, seems to be struggling in the polls for several reasons. Firstly the PSSH has been taken over by internal division and also by tension on the left generally. Its leader, Edi Rama, has to take care of the Socialist Movement for Integration on his left led by Ilir Meta and also deal with the opposition of former Prime Minister (1990-1991, 1997-1998 and 2002-2005) and former PSSH leader, Fatos Nano. The latter maintains that "Edi Rama is a thief who stole the party and privatized the capital of Tirana." During the local elections on 18th February 2007 he called on voters to support the Democratic Party candidate, Sokol Olldashi, for the town hall in Tirana rather than for Edi Rama. Although the Socialist Party won 24.82% of the vote during the local election the coalition formed by the Democratic Party (PDSH) and the Republican Party (PRS) won the election with 27.24% of the vote (21.81% for the PDSH and 5.43% for the PRS). The Socialist Movement for Integration won 9.33% of the vote. The PSSH is also suffering because of the PDSH's campaign which is accusing some of its members and notably its leader of being involved in a building permit scandal in Tirana. Finally Edi Rama refused to lead the PSSH list on 28th June next relinquishing his place to Vasilika Hysi. This decision, which was surprising on the part of a man who hopes to become the next Prime Minister, has upset the Albanians. According to a poll by the international institute IFIMES more than half of the Albanians say that the composition of the lists will not influence how they vote and that above all they will vote for a political party; 43% say the opposite and say they will decide according to the lists of candidates. The latest polls still grant a 2 to 4 point lead to the PDSH over the PSSH.